Dr. Branimir Z. Jugović, BS Chem.Eng. Branimir Jugović was born on January 22nd, 1976 in Čačak. He graduated from the Faculty of Technology and Metallurgy in Belgrade in 2001. 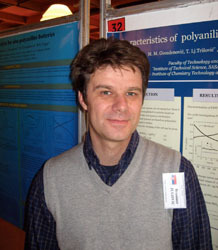 He was awarded a stipend of the Kingdom of Norway among 1000 best students of Yugoslavia in 2000, and in 2001 a special recognition of the Serbian Chemical Society for extraordinary achievement during graduate studies. He completed his MSc studies at the Faculty of Technology and Metallurgy in Belgrade in 2005 with the thesis titled Electrochemical sedimentation and characterization of Ni/WC composite films. He was elected Research Assistant in 2005 at the Faculty of Technology and Metallurgy in Belgrade. In December 2008, Branimir Jugović defended his doctoral thesis at the same faculty. In 2009, he was elected Senior Research Associate. In 2014, he was elected Principal Research Fellow. Fields of interest: electrochemical engineering, accumulators and zinc-polyanilyne batteries, composite films. He has been working at the Institute since 2002.